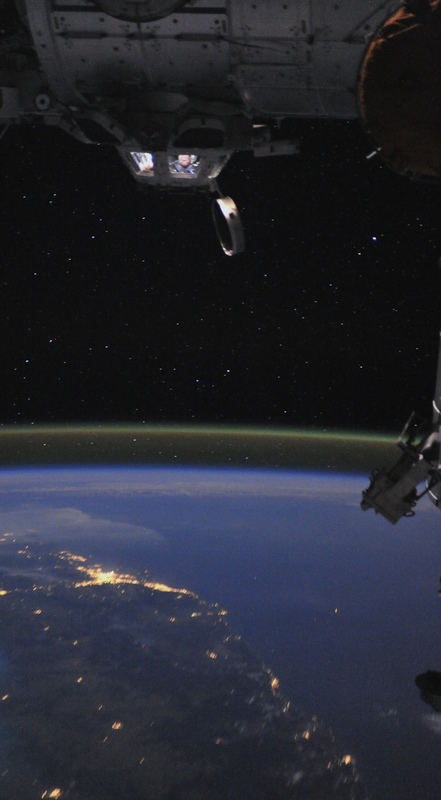 ISS astronaut Ron Garan peers out if the Station's cupola at the Earth below. In what may be the best single representation of the visual feast of images we have enjoyed from Expedition 28 flight engineer Ron Garan during his 5 1/2 month stay aboard the ISS, this amazing image shows him inside the Station’s cupola as he took his last images of Earth before departing. I must say, if anything embodies the blurring line between science fiction and science reality that’s become a daily part of our lives… this is it. Thanks to Ron for sharing this on his Twitter feed! Follow him on Twitter @Astro_Ron, and be sure to check out his website FragileOasis.org and become a member there. UPDATE 4/16/12: Ron shared this post on his Google+ page… he says “I call it ‘Downside Up Downunder’.” Thanks again Ron!